David Haye’s swift departure from his rematch with Tony Bellew has opened the door for former undisputed heavyweight champion, Tyson Fury to take his place. The man who calls himself the ‘Gypsy King,’ however, has to step in front of the National Anti-Doping Panel first to see whether he will be cleared of all charges of taking illegal substances shortly after his last fight with Wladimir Klitschko. If all goes well, the fight with Bellew should be free to go ahead, not that it is especially likely to happen next. Still, these early looks are always fun, so let’s look under the surface! It seems that Liverpudlian Bellew has gotten better as the years have gone by. After losing to Adonis Stevenson in 2013, he has captured the EBU crown as well as the WBC cruiserweight title with an incredible knockout of Ilunga Makabu last year. After making the first successful defense of that, his fight with Haye was set in motion and proved all the doubters wrong when he dismantled him for a TKO win in 11 rounds. After brief negotiations, a rematch was set in place for December 17th but a nasty injury has forced Haye to take time out. Tony Bellew pulled out all the stops to defeat David Haye. In the meantime, Tyson Fury had been concentrating on getting himself well after suffering from severe depression which caused him to exit the sport and vacate his titles. After a couple of retracted announcements of a comeback, he finally seems settled on making a legitimate return. You would think that he would take a warm up fight first, but perhaps Fury would see Bellew as such. Providing that David Haye does not derail the potential fight by confirming that everything is all well with him once again, a Bellew v Fury contest at first seems a little bizarre to consider. Fury would have at least a 30lb advantage and is a true heavyweight. In contrast, Tony came in to the fight with Haye at 213lb, heavily indicating that he is not a natural heavyweight boxer. If he is allowed, Fury could elect to shift a lot of his weight on him to drain him and then go for a knockout win. But not enough credit is being given to Bellew here. Tyson Fury is a true heavyweight fighter who would look like Goliath next to Tony Bellew. Few thought that he could pull off the victory against Haye when in fact he made it look rather simple. His timing was impeccable, as was his gameplan of making the usually blistering hands of the Bermondsey fighter miss with wide hooks and his famed hayemakers. He would follow up with counters and even show what his chin was made of when he would trade punches with him at times! 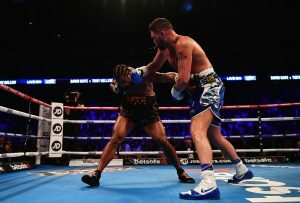 It turned out to be one of them fights that catapulted the obscure Bellew into stardom with a huge win over a big name. Fury, though, may not look and sound the part due to his candid personality, but he steps up to the plate when it is called for. This has been proven in his fights with such names as Kevin Johnson, his second fight with Dereck Chisora, his rematch with John McDermott and, of course, the fight with Klitschko that shocked the world. He has been floored by much lesser names like Neven Pajkic but it looks likely that he sometimes takes certain fighters lightly. He should eradicate this mind set when facing opponents that do not look likely to win on paper. A fight is a fight! In any case, skill for skill, Bellew v Fury is an intriguing bout. Both have proven to pull out all the stops when they know that they are in the ring with somebody who poses a profound threat. But the height and reach advantages that Fury possesses, as well as a high ring IQ, convinces me that he would be the one celebrating a win. 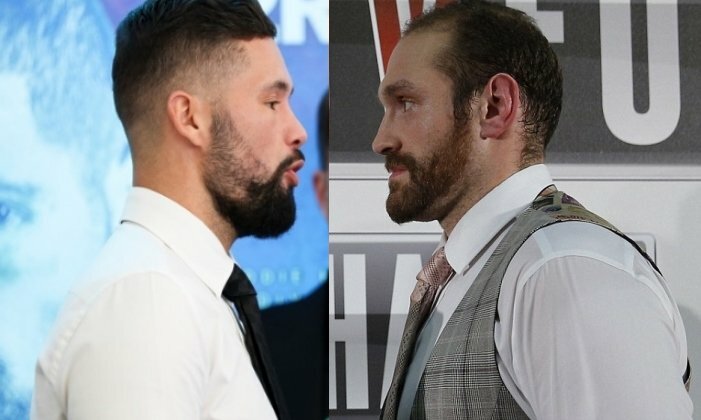 It is probable that the bout would be quite tactical.The jab from Fury would offset Bellew and he would use his footwork to keep moving and not get roped into a brawl. Fury pulls out all the stops when he needs to such as when he fought and won the heavyweight titles. But if Bellew did manage to convince Fury to trade with him then, as Steve Cunningham demonstrated, he can be put on his back by boxers who weigh much less. Fury has possibly learned from his past mistakes, though. And he would know that it would be foolish to take risks and scupper any plans for big fights in the future with the likes of Anthony Joshua.